Michael Lee Aday (Meatloaf) is an American musician, singer, songwriter, record producer and actor usually known by his stage name “Meat Loaf”. He is noted for the Bat Out of Hell trilogy of albums, consisting of Bat Out of Hell, Bat Out of Hell II: Back into Hell, and Bat Out of Hell III: The Monster Is Loose. Bat Out of Hell has sold more than 43 million copies worldwide. Almost 40 years after its release, it still sells an estimated 200,000 copies annually, and stayed on the charts for over nine years, making it one of the best selling albums of all time. He is also known for his powerful wide-ranging operatic voice and theatrical live performances. Acrylic print in home office setting. After he enjoyed success with Bat Out of Hell and and earned a Grammy Award for Best Solo Rock Vocal Performance for the song I'd Do Anything for Love, Meat Loaf experienced some initial difficulty establishing a steady career within the United States. However, he has retained iconic status and popularity in Europe, especially the United Kingdom where he received the 1994 Brit Award for Best selling album and single, appeared in the 1997 film Spice World, and ranks 23rd for the number of weeks spent on the UK charts as of 2006. He ranked 96th on VH1's 100 Greatest Artists of Hard Rock. He is one of the best-selling music artists of all time, with worldwide sales of more than 80 million records.He has also appeared in over 50 movies and television shows, sometimes as himself or as characters resembling his stage persona. His most notable roles include Eddie in the The Rocky Horror Picture Show (1975), Robert Paulson in David Fincher's Fight Club (1999) and The Lizard in The 51st State (2002). 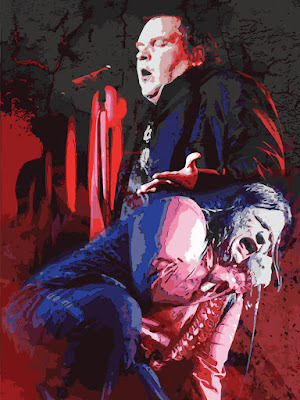 Meat Loaf is said to have cheated death on numerous occasions, crashing in a car that rolled over, being struck on the head with a shot during a shot put event, jumping off a stage during a concert and breaking both of his legs. Most recently he collapsed again while on stage in Edmonton on June 16, 2016, due to severe dehydration after having cancelled two other shows due to illness.